When Ella Miranda first sat on Kinnordy Go Girl she knew it was a match made in heaven, and their win in the Gyro Plastics Junior High Points Series in their first season together underlined just how right she was. In the final of the series, Ella and Kinnordy Go Girl placed fourth, with Lauren Mitchell (Kumeu) aboard Craighaven Black Heart taking out the class, just a single point ahead of Amelia Newsom (Tauranga) on Tribute OL. 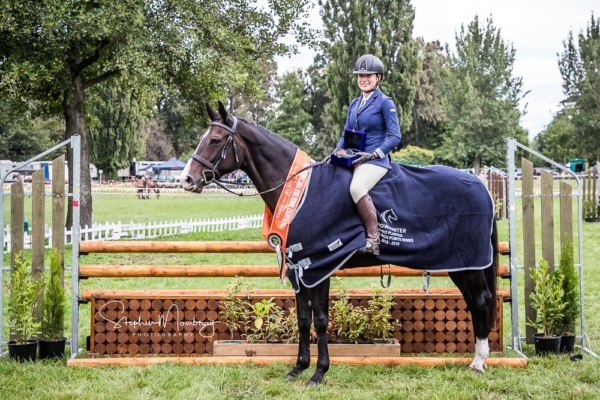 Recently they won the Prebbles Equestrian Show Hunter Series which was run in the high points classes from three shows in the Manawatu Horowhenua area. There’s a lovely twist to Ella’s story – she bought Kinnordy Go Girl off Trudi Duncan whose company is the sponsor of the series the new combination has won. Kinnordy Go Girl is Ella’s first hack, but the horse has previously won the Junior High Points Series in the hands of another rider. And Ella has some big plans for the future. Results – Gyro Plastics Junior High Points Series: Ella Miranda (Feilding) Kinnordy Go Girl 68 points 1, Georgia Allison (Oxford) Paintball 56 points 2, Antonio Matangi (Levin) Shoeshine Polish 45 points 3, Lauren Mitchell (Kumeu) Sonny Bill 44 points 4, Emily Twort (Henderson) Cameo KSNZ 43 points 5, Lauren Mitchell (Kumeu) Craighaven Black Heart 38 points 6. Final class: Lauren Mitchell (Kumeu) Craighaven Black Heart 1, Amelia Newsom (Tauranga) Tribute OL 2, Emily Twort (Henderson) Cameo KSNZ 3, Ella Miranda (Feilding) Kinnordy Go Girl 4, Madison Wiffen (Wellington) Ponga 5, Lauren Mitchell (Kumeu) Sonny Bill 6.